the surgeon (short robe). French caricature of the late eighteenth century. In this prelude we limit discussions to the evolution of knowledge in the medical field, recognising that the emergence of the European renaissance saw wide changes and developments in societies throughout Europe. These changes precipitated a progressive period of evolution in education and in the development in the medical field. In consequence of the gradual progress in understanding of disease, the place for hospitals in the care of adults and subsequently hospitals for the treatment of children developed. The term paediatrics did not develop until the 19th century. The earlier development of special groups within medicine was confined largely to the “thinkers” (physicians) and to the “doers”(surgeons) but specialties such as paediatrics had not developed, nor any thought of the British Society for the History of Paediatrics and Child Health until the 21st century. Change occurred in the individual countries at a varied pace after a long period of relative inactivity in the intellectual field. For the previous millennium the attitude seems to have been “Galen (c.130AD to 210 AD) has pronounced and no further questioning is necessary”. Galen was of Greek origin but this profound philosopher and researcher moved to Rome where he spent most of his life. In the medical field, his pronouncements from Italy were held as facts for over a thousand years before major challenges to his definitions in anatomy and in other spheres emerged. The extent of the mobility of individuals in search of higher education was surprising as travel took considerable time and was not comfortable. Moving forward to the European Renaissance this mobility was evident with for instance Vesalius. Born in Belgium he moved via the Netherlands to Leuven, then Paris and to centres in Italy where his main contributions were recorded. Vesalius (1514-1564) was a major contributor to the new approaches. 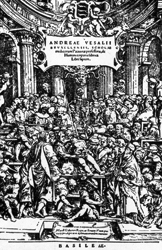 He stimulated interest and learning by his public dissections and lectures. Instruction in anatomy had been continuing before him but he took the unusual step of both doing the dissection and lecturing, explaining the findings as his dissection unfolded the relationships between muscles, joints, bones and the viscera. This followed his discovery that Galen’s pronouncements had been based on animal studies rather than on humans. Accuracy was greatly improved from that given by previous teachers where a technician dissected and a poorly informed lecturer spoke on the subject to his audience. Britain did not respond rapidly to the changes evolving in Europe. It was not the fashion to have public dissection but Dr John Caius in 1543 visited Vesalius and several centres in Italy, Germany and France before returning to England. He was an early visitor to Europe and became a member of the College of Physicians of London and subsequently was President for many years. In the 15th and 16th centuries there were four universities established in Scotland whereas in England the much older Cambridge and Oxford universities controlled higher education and the development of the other universities did not occur until the 19th century. The pattern which became common was for Scottish doctors to travel to the continent for further studies to Europe although some did travel to England. A limiting factor was the development of the College of Physicians of London (1518) which originally was empowered to exert local control of medical practice but within a decade had its authority extended to the whole of England. To become a member you had to be asked to attend for interview/examination and with the rivalry between the south and the north Scottish graduates, particularly those from Edinburgh, were regarded more as enemies rather than colleagues. It could be difficult to obtain an invitation and therefore be authorised to establish a practice in the south.